Press Room Archives - Elias and Williams: The Inside-Out of Skin by dermatologists and skin researchers Peter M. Elias, M.D. and Mary L. Williams, M.D. 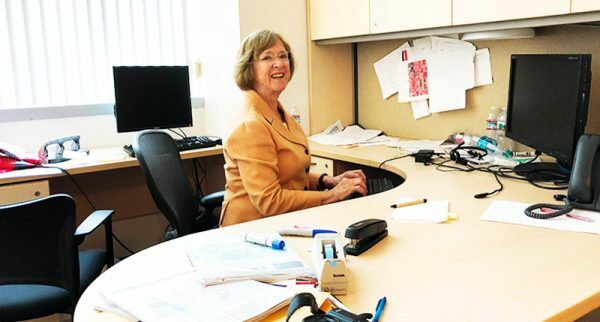 On March 21,2019, Dr. Mary L. Williams joined University of California San Francisco colleagues, Drs. 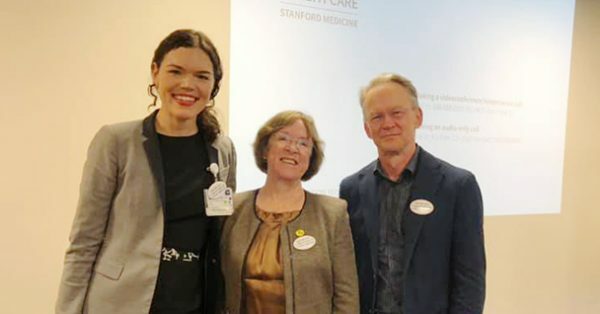 Sarah Coates and Timothy McCalmont, for a Department of Dermatology Grand Rounds presentation at Stanford University entitled: “The Impact Of Climate Change On Dermatology and What We Can Do About It”. Dr. McCalmont outlined the present and predicted consequences of carbon emissions on the world climate and offered personal observations its impact on him. Then Dr. Coates discussed the ways in which climate change will impact infectious diseases of the skin. Dr. Williams briefly summarized other impacts on skin health and discussed what was happening within the American Academy of Dermatology to address this issue. Mary L. Williams, MD. (left) and Misha Rosenbach, MD. 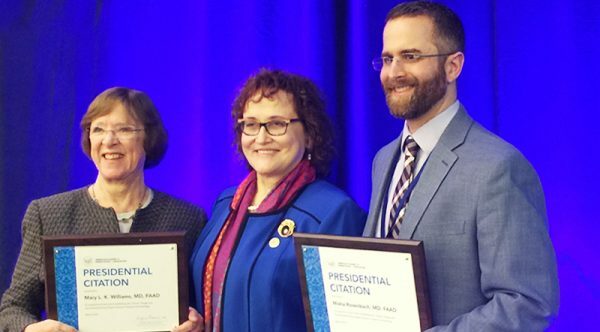 (right), with AAD President Suzanne Olbricht, MD, receiving Presidential Citations for their work establishing an Expert Resource Group on Climate Change and Environmental Issues within the American Academy of Dermatology. Dr. Williams and colleague, Misha Rosenbach, M.D., of the University of Pennsylvania Department of Dermatology, were awarded a Presidential Citation and honored as Stars of the Academy at the Annual Meeting of the American Academy of Dermatology in Washington D.C.. Drs. Williams and Rosenbach were honored for their work in establishing an Expert Resource Group on Climate Change and Environmental Issues within the AAD. This group, founded in 2017, is working to bring awareness of the impacts of climate change on skin health to the dermatologic community, to introduce for measures that will reduce the carbon footprint of dermatology, and to advocate for climate solutions. Dr. Williams serves as the liaison from the AAD to the Medical Societies Consortium on Climate and Health. The UCSF Office of Sustainability Newsletter of March 2019 presented an article entitled “UCSF Faculty Act on Climate Health Connection“, highlighting Dr. Williams’ recent work within the American Academy of Dermatology to bring awareness of the consequences of climate change and environmental pollution on skin health to the fore of the dermatology community and to build a platform to ‘green’ dermatologic practices. Peter M. Elias, M.D., Delivers Invited Lecture On Atopic Dermatitis To Society Of Cosmetic Chemists. In his address to the New York Chapter of the Society of Cosmetic Chemists on November 7, 2018 in Fairfield, New Jersey, Dr. Peter M. Elias, M.D. chose as his subject: “Pathogenesis of Atopic Dermatitis”. In this presentation, he reviewed the pathogenesis of atopic dermatitis as a disorder of the epidermal permeability barrier, including the key role of an elevated pH in initiating several downstream negative consequences for the barrier and immune system. The therapeutic options that derive from this concept include the importance of lowering the pH of the stratum corneum; the putative benefits of suberythemogenic UVB; and a comparison of the mechanisms of action of triple physiologic-based vs. bland moisturizers. Dr. Elias also reviewed his recent studies, showing that most moisturizers do not help the barrier, and are often toxic in individuals with ‘sensitive’ skin, including patients predisposed to develop AD. Finally, he described a new, inexpensive type of instrumentation to measure transepidermal water loss and hydration that should allow patients and caregivers to monitor responses to therapy, and to assess the efficacy of different moisturizers. On October 17, 2018, Dr. Mary L. Williams joined University of California San Francisco colleagues, Drs. Sarah Coates and Timothy McCalmont, for a Department of Dermatology Grand Rounds presentation entitled: “Climate Change, The Skin And Dermatology”. Dr. Coates outlined the present and predicted consequences of climate change and how some of these are already impacting skin conditions. Dr. McCalmont offered personal observations on the changing climate, while Dr. Williams discussed what was happening within the dermatologic community to address this issue.